With the iPad iOS 5 came the Split Keyboard feature. 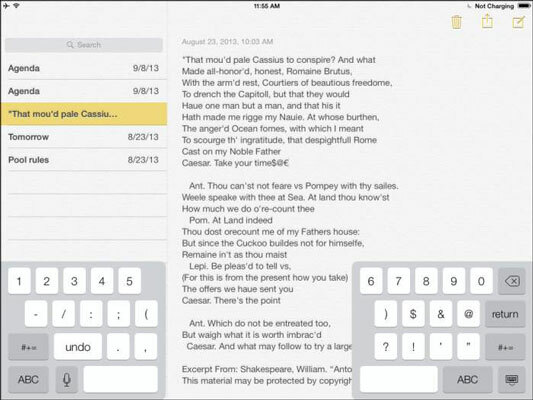 This allows you to split the keyboard so that each side appears nearer the edge of the iPad screen. For those who are into texting with their thumbs, this feature makes it easier to reach all the keys from the sides of the device. Open an application, such as Notes, where you can use the onscreen keyboard. Tap in an entry field or page, which displays the onscreen keyboard. Place two fingers in the middle of the onscreen keyboard and spread them toward the left and right. The keyboard splits, as shown in this figure. Hold the iPad with a hand on either side and practice using your thumbs to enter text. To rejoin the keyboard, place two fingers on each side of the keyboard and swipe to join them together again. When the keyboard is docked and merged at the bottom of your screen, you can also simply press the Keyboard key and swipe upward simultaneously. This undocks and splits the keyboard. To revert this, press and swipe the Keyboard key and swipe downward. The keyboard is docked and merged.